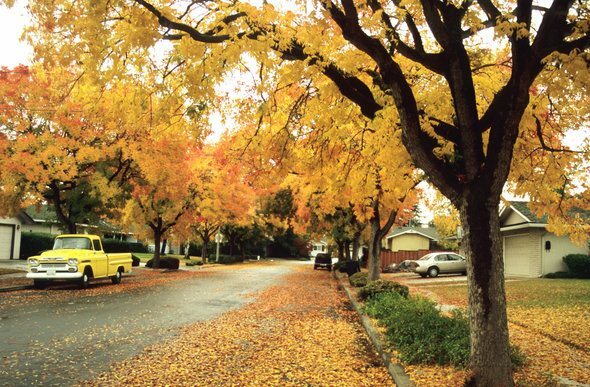 The Most Livable Mid-Sized Cities in the U.S. The best places to live are often the most expensive. This is especially true in some of the biggest cities in the country. But there are still some fantastic places in the United States boast more affordable homes, low unemployment rates and come without the hustle and bustle of big cities. Below we rank the most livable mid-sized cities in the country. Ready to buy? Check out current mortgage rates. 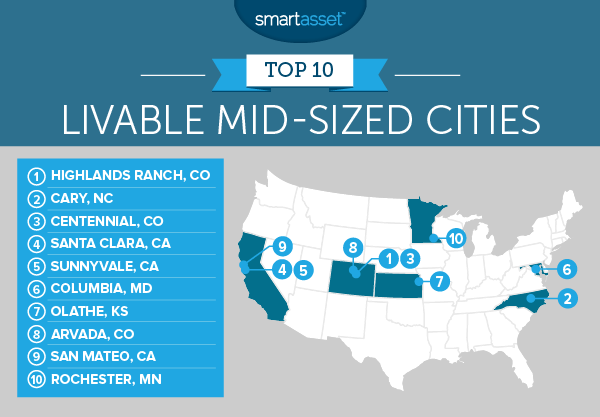 In order to rank the most livable mid-sized cities in the country, we looked at eight factors. We compared cities across the Gini coefficient (a measure of inequality), average commute time, uninsured rate, unemployment rate, median household income, poverty rate, monthly housing cost and median home value. For more on these factors, see the data and methodology below. California and Colorado – These two states claimed six of the top 10 spots. In particular these states score well in the economic metrics. In cities like Highland Ranch, Colorado and Santa Clara, California, for example, the average household earns over 100,000 per year. Unlivable Connecticut? – According to our data, Connecticut contains some of the least livable mid-sized cities in the country. Four of the bottom five cities are located in Connecticut. They are Hartford, New Haven, Bridgeport and Waterbury. Costly mid-sized cities – Even in mid-sized cities, which tend to be more affordable, the cost of living can be high. For example, the average median housing cost across our top 10 cities is over $1,600 per month. The reason Highlands Ranch is so livable is because of the strong local economy. Our data shows that Highlands Ranch has an unemployment rate of only 2.4%. That’s the lowest in our study. Many Americans get health insurance through their jobs, so it may not be surprising to see that with such a low unemployment rate, Highlands Ranch also has a high rate of residents with insurance. Only 1.4% of residents here do not have health insurance. Financially speaking Highlands Ranch residents are also doing well. The average household earns over $111,000 per year. However, you may need a relatively large income to live here. The median home costs over $1,700 per month. Cary is one of the safest cities in the country. This city is more than just a safe place though, it is also one of the most livable mid-sized cities in the country. One reason why Cary is so livable is because of the low rate of people under the poverty line. Our data shows that only 4.5% of residents here have an income that puts them below the poverty line. The unemployment rate is similarly low at 3.5%. That’s the third-lowest rate in the top 10. Another Colorado town takes third. Like those who call Highlands Park home, the unemployment rate for residents in Centennial tend is low. The unemployment rate is only 3.3%, the second-lowest rate in the top 10 and a top five score overall. However, many residents who live here tend to work relatively far from their jobs. The average resident had a 25-minute commute. That’s a below-average score. Santa Clara residents tend to be high earners. The average household here earns just shy of $109,000. That income comes in handy when Santa Clara residents pay the mortgage. The median home here costs over $2,100 per month. For that metric Santa Clara has the second-worst score in our top 10. Homes here are also really valuable. The median home here is worth over $846,000, the fourth-most in our study. This city shares much with other cities in our top 10, like great employment opportunities and a low poverty rate. Sunnyvale is also a well-placed city to enable its residents to be high earners. It is located just southeast of Mountain View and Palo Alto. Sunnyvale is also the city with the most valuable homes in our study. The median home here is worth almost a cool $1 million. If you’re looking for a mid-size city with low income inequality, Columbia, Maryland could be your best bet. Columbia has a Gini coefficient of only 0.36, the best score in the top 10. This city is also chock-full of high-earning households. The median household income here is just over $100,000. One concern for residents, however, is that getting to work can be a long process. The average commute for Columbia residents is just shy of 30 minutes. That means almost one hour per day getting to and from work. If you are looking for work, Olathe, Kansas is a good place to be. The unemployment rate here is only 4%. One area where Olathe beats other cities in our top 10 is in affordability. The average home here costs $1,200 per month. 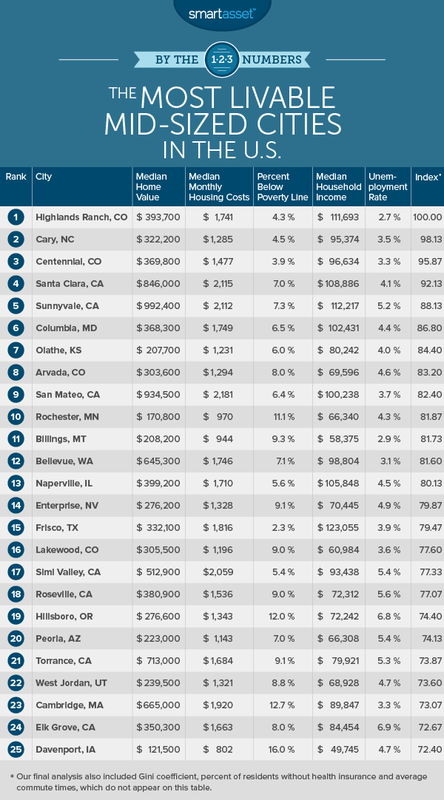 That’s the second-lowest median cost in the top 10. If you’re looking for steady employment Arvada is a great city to live. Only 4.4% of residents are unemployed. Another perk of living here, other than the availability of jobs, is that work here tends to pay well. The median household earns just shy of $70,000 per year. Over 90% of residents have an income which puts them above the poverty line. If paying a ton in housing makes you queasy, San Mateo may not be the place for you. Average housing costs top $2,100 per month. However if living in a place where jobs are available and those jobs pay well excites you, consider San Mateo. The California city ranks in the top 15 for those two metrics. Our top 10 ends in Rochester, Minnesota. Rochester has many factors working in its favor. For example, home payments will only set the average resident back $970 per month. For that metric Rochester has the best score in our top 10. Another plus to living here is the short commute times. It takes the average Rochester resident only 16 minutes to get to work. That certainly makes for a stress-free morning! Gini coefficient. This is a measure of income inequality. The Gini coefficient is a number that’s always between 0 and 1, where a score of 0 means a population has achieved perfect equality and a score of 1 represents perfect inequality between rich and poor. Data comes from the U.S. Census Bureau’s 1-Year American Community Survey. Median monthly housing cost. Data comes from the U.S. Census Bureau’s 1-Year American Community Survey. Percent of residents below the poverty line. Data comes from the U.S. Census Bureau’s 1-Year American Community Survey. Median household income. Data comes from the U.S. Census Bureau’s 1-Year American Community Survey. Unemployment rate. Data comes from the U.S. Census Bureau’s 1-Year American Community Survey. Percent of residents without health insurance. Data comes from the U.S. Census Bureau’s 1-Year American Community Survey. Average commute time. Data comes from the U.S. Census Bureau’s 1-Year American Community Survey. We began by ranking each city in each metric. Next we found each city’s average ranking, giving equal weight to each metric. Using this average ranking we created our final score. The city with the best average ranking received a 100. The city with the worst average ranking received a 0. Switching from renting to buying can be tough. Here are some tips to help you hit your financial goals. Like with any financial objective, having a budget will keep you organized. Keep in mind when it comes to buying a house, you are not just buying a house. You will need to factor in the down payment and also closing costs. All these are different parts of the home-buying experience you’ll need to budgeting for. The first part of buying a home is typically saving up for the down payment. It is usually recommended that a prospective home buyer puts down 20% of the home value – though this may differ depending on your financial situation and your lender. In order to save up for that, it may make sense to cut back and save more. Take a look at your spending habits and see where you can cut back. This will differ from person to person. For some it may mean eating out less and for others it could even mean moving into cheaper accommodation. Another good option is to put financial windfalls like your tax return or work bonuses into a savings account, which is easily accessible. Once you have saved up a chunk and are ready to house hunt, check out our how much home you can afford calculator. It will provide a breakdown of what you can expect to pay and what you can realistically afford. One way to keep housing costs low is to get a low mortgage rate. It may make sense to make sure your credit report is as strong as it can be before you apply for a loan. This will likely work in your favor when it comes to getting a favorable mortgage rate.